Aug 18, 2011 - St-Sgt Moshe Naftali, 22, of Ofra was one of eight victims of a series of terrorist attacks perpetrated against civilians and IDF soldiers in Israel''s southern region. St-Sgt Moshe Naftali was killed in the first volley of gunfire when terrorists attacked his force while on their way to assist a civilian bus that was fired upon by terrorists. The terrorists exploded a roadside bomb at the patrol and opened fire on the troops as they exited the damaged cars. One of their bullets killed him. 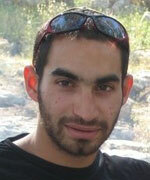 The commander of the Golani Reconnaissance unit eulogized Naftali: "Moshe was killed leading his troops heroically." A resident of Ofra, and the second of seven siblings, Moshe graduated from the yeshiva high school in Beit El and studied at Moshav Keshet on the Golan Heights before joining the IDF''s Golani Brigade. He had recently completed commander''s course and served in one of the IDF''s reconnaissance battalions. His mother said, "I know in my heart as a mother that Moshe fought bravely. My beloved son was dedicated and persistent in everything he did. He was an exemplary soldier who accomplished every goal he had. He did everything he could for Israel out of pure faith and belief in his actions." St-Sgt Moshe Naftali was buried at the Mount Herzl Military in Jerusalem. He is survived by his parents and six siblings.